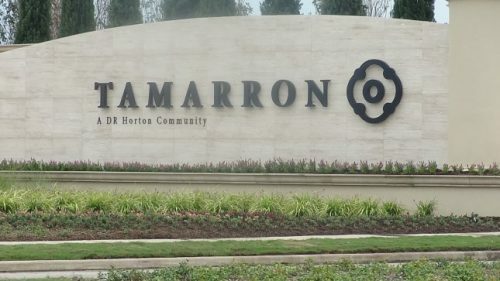 Tamarron homes for sale are located on the far-west side of Katy in Fort Bend County…close to FM1463. This is a new neighborhood that just started in 2014 and currently has several hundred homes built with plans to have a total of 4000+ homes (approx.) when completed. On average, these homes are two-story homes with 4 bedrooms, 2+ baths, and approximately 2900sf with 2-car garages. This newish neighborhood does not have mature trees but it does have a community clubhouse with fitness center, playground, resort-style swimming pool, lap pool, tennis courts, walking trails, and sports fields. Here’s a map of where Tamarron homes for sale are located. The following table shows the schools zoned to Tamarron. If you want the current ratings for these schools, please download the Katy Neighborhoods Guide. Since Tamarron Katy is so new and the schools are new, there is no demographic information for the schools at this time. The annual HOA fee, which pays for the amenities, is approximately $1100 but may vary depending on the lot. Go to the Tamarron Katy HOA website for helpful phone numbers, community documents, and utility information or call 281-870-0585. Property taxes in this neighborhood may vary slightly, but are approximately 3.46 as of April 2018.